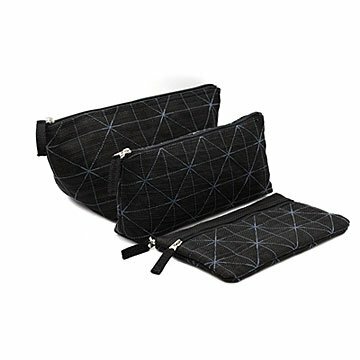 This stylish, water-resistant travel set made of reclaimed netting protects your stuff and provides jobs. You've reached your hotel, found your room, opened your suitcase... and your conditioner lost its cap en route. Bye-bye, best business blazer. Ta-ta, tablet. Safeguard your belongings in style with this water- and stain-resistant, three-piece travel set. Lightweight yet virtually indestructible, their touch of modern industrial chic is 100% authentic: the "fabric" is netting remnants reclaimed from factories. Instead of being dumped into landfills, it's sewn into cases and pouches with a uniquely cool look. Most of its Cambodian makers are hearing impaired, polio or landmine survivors, or moms who used to be trash pickers. They get training and fair wages in a safe working environment, while proudly making ultra-craveable bags. Set of 3. Handmade in Cambodia. Includes zip case: 8" x 4.75", slim case: 9" x 4.75" x 4", and square pouch: 11.5" x 5" x 5"